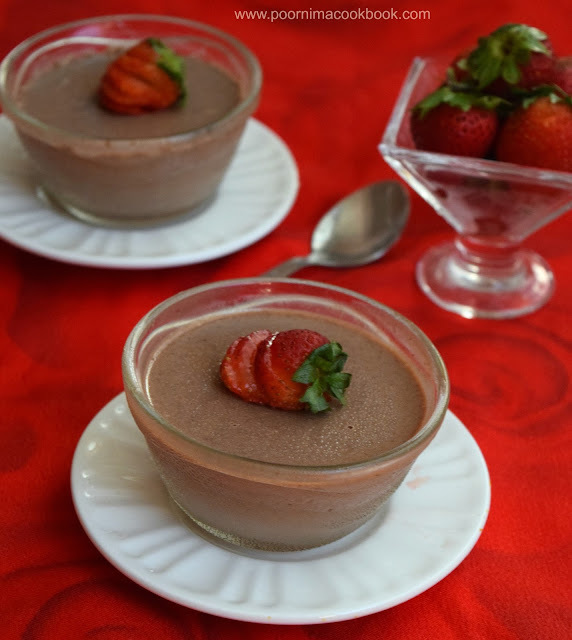 Here is a perfect dessert treat, "Chocolate Panna Cotta" to celebrate the 4th year anniversary of "Poornima Cookbook"! I am excited and thankful to my family, friends and followers for their encouragement & support throughout this journey. Feedback from those trying my recipes, keeps me motivated to post more and more. Pannacotta is a classic, popular, easy to make Italian custard. Pannacotta means "cooked cream" in Italian. It is made by simmering together cream, milk and sugar; mixing this with gelatin and letting it cool until set. You can try out adding different flavours, but this one is for the chocolate lovers! Check Vanilla-pannacotta-with-pomegranate jelly which is one of my earlier posts! Let's go through the recipe now. Sprinkle the gelatin over the ¼ cup of cold milk in a bowl and let it stand until the gelatin softens, for about 5 minutes. Chop the chocolate into pieces and keep aside. 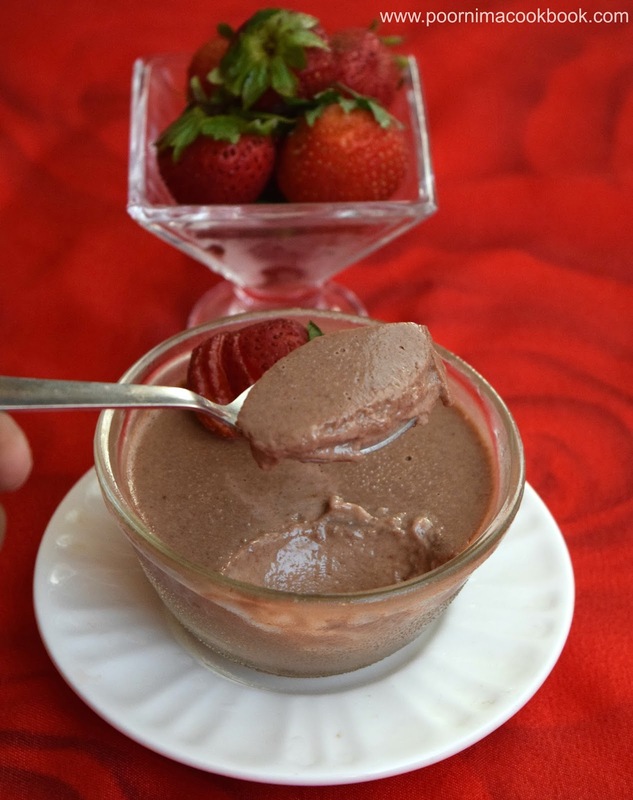 Melt the chocolate in double boiler method or in microwave; keep asde. Just heat cream, remaining milk, sugar and vanilla essence in a pan over medium heat (do not boil). Add the soaked gelatin and stir until dissolves. Remove from the flame and add melted chocolate; mix well. Divide the mixture among the serving bowls / glass and place it in the refrigerator for at least 2 to 3 hours or until completely set. Once it is completely set, enjoy this lip smacking, creamy dessert! Depending on the size of the glasses your setting time will vary; mine took approximately 2 hours to set. If you want to prepare this for parties (large amount), just double or triple the quantity. Superb. Anything with Chololate is fine for me.